Saturday Joann ( My better half) Joined me for an exciting day on the water. We headed south down the ship channel and there were boats everywhere especially around the Jetties, So we headed ot to some near rigs and not a boat in site. Joann put a gold spoon on and landed 15 nice trout on 15 casts. But on #16 she got a surprise a 75# shark grabbed her spoon and after 30 minutes the shark gave it up and Joann won the fight. After a few nice pics I cut it free, and finally I got a chance to put the net down and catch my limit along with some 4# mackerel and 2 pompano( they were great on the grill last night). 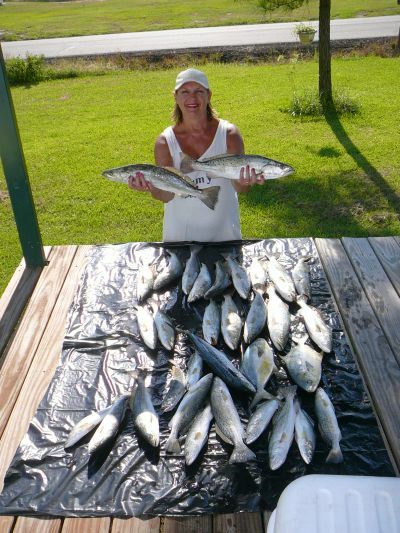 Both the weather and the fishing is Hot so give me a call 318-675-9114 I have a few openings and the weather looks Great. 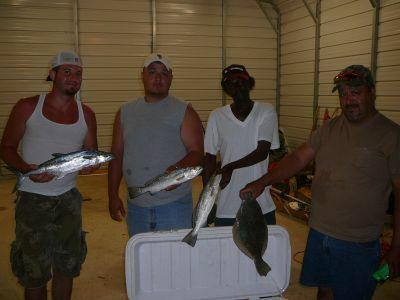 Friday 08/10/07 I had the pleasure of fishing with Dwayne Chapman from Minden, his son Travis and friend Mark. They were Pre- fishing the 5th annual Port Aggregate Big Fish Spec-Tacular. I introduced them to using Berkley Gulp Baits and after a great day on the water they were sold on Gulp. Then the next morning using a 3″ natural shrimp tail Dwayne lands this 5.62 # Trout to win the tournament!!! Congratulations Dwayne. I truely enjoyed the opportunity to be a part of your great win. Thursday David A.came over from Houston for a great day on the water. We started in the ship channel and caught a few on DOA’s under a cork but the tide was very light and the wind was calm so we decided to move outside to some near rigs. In no time we were boating nice trout on Gulp tails and ended the day with 2 nice limits and a few Mackerel to boot. I went on a scouting mission to find fish for my trips this week and located tons of bait and fish in the ship channel near marker 77 and caught a nice limit including this 4#er. 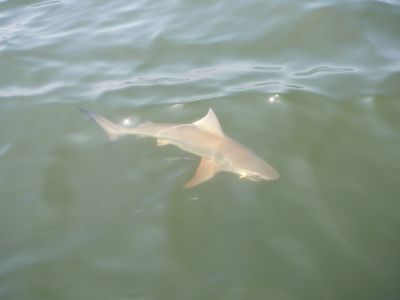 Then I went for Reds I found them down by the Jetties and caught 22. At one point I had 14 in a Row on Gulp and Gold Spoons. The fishing just doesn’t get much better. Today Mario and some friends from Shreveport came to visit. We again tried to start the day at the Jetties and again it was very crowded so again we moved north and put 13 nice flounder in the cooler. 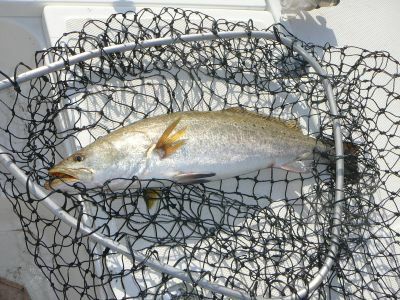 But these guys wanted some trout and the wind was low so we made a run to some near rigs and thanks to Mario’s persistant probing we found some nice 2# trout and had a ball filling the cooler untill a big storm chased us back inside the Jetties & off the water. But these guys were great to fish with and lik Arnold they promised They’d Be Back!